Does your TV suffer from a bad case of the reception blues? Pix-elated images? Frozen channels? 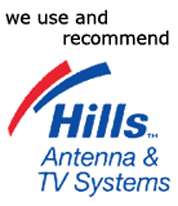 Then we recommend one dose of Telesignal Antenna Systems to clear things up nicely! TV fault? Bad reception? Interference? As every doctor knows, a diagnosis is crucial when deciding upon treatment. If your reception problem has just started, check with neighbours to see if they are affected as it could be interference, which can be caused by the transmitter or weather problems. In many cases, these issues can be resolved without having to replace your TV antenna. Then of course there is your TV antenna. You might have a state-of-the-art TV but if your antenna isn’t up to scratch, your picture won’t be much better than if you were watching it from an old-fashioned portable. Our specialist equipment enables Ian to do a full diagnosis, checking for faults on your TV, connections and antenna. There’s nothing that gets past our vast experience in antenna repairs and servicing. In most cases, we can offer a same-day repair. Trust in the professionals for a fast, reliable service that will give you a picture so sharp and clear, you’ll feel part of the action. Contact us online or call us on 0417 809 403 for a friendly chat and a competitive quote. We accept cash, cheque and eftpos payment so you have more than one way to pay.